Did you know that Raleigh has a very large bicycle community. From recreational riders to those who rely on a bike to go everywhere as the majority of people do with cars. Many of these people are trying to reduce their carbon footprint by getting a car off the road, good for them for doing so. As our city grows, so will our traffic issues. Having more of our citizens on bikes relieves some of the traffic congestion. There in which lies a problem. Many cyclists in Raleigh have been trying to get the Raleigh City Council to notice that a painted line isn't really providing any safety for our two wheeled friends. 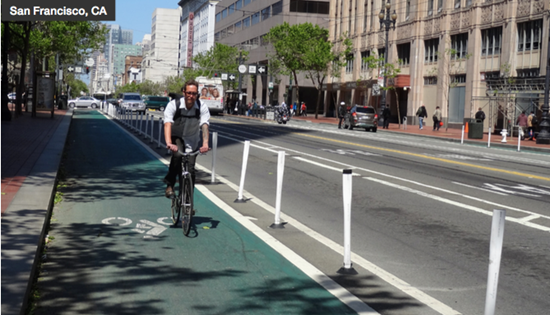 I am proposing the city puts down plastic bollards on the existing white lines that separate auto/bike lanes. These are cost effective and provide some safety to those that commute under their own power. Should we choose to go this route, we will be helping reduce traffic incidents between drivers and cyclists by having appropriate and safe lanes for both to ride in. These can easily be removed should we need to repaint or maintain a road, so any future plans for road construction won't be held up by these bollards. Agree? Disagree? Let me know by contacting me with suggestions or comments.